I slept in the middle most nights, Jeff on my left and Monte on my right. This night was no different until Jeff woke Monte and me up at 11 o’clock. “Guys, there’s water,” Jeff said, with an unalarming note of urgency. Still half asleep, I responded the only way I could: “What do we do?” When I sat up I realized three things. First, my assumption was wrong, it wasn’t raining. Second, Jeff should have woken us up with a couple more notes of urgency in his voice. Third, my sleeping pad, with me on it, was floating in five inches of water. Ten minutes and a waterlogged tent later, the three of us were lying in the dirt with a tarp stretched over our faces to keep dry. Now, it had begun to rain. Great. 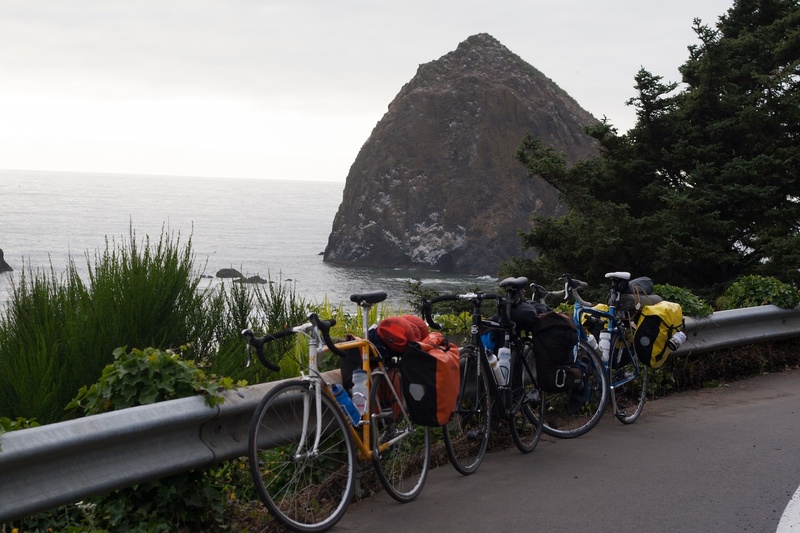 That was day nine of our 25-day cycling tour down the Pacific Coast. I learned a lot over 1,750 miles, one beer split three ways (to keep our spirits high), and six flat tires. Let me tell you about two of those things. The first thing is simple; don’t set your tent up in the bed of a costal river that runs directly into the ocean. When the tide comes in, the riverbed becomes a waterbed and a sleeping pad becomes a flotation device. We should have known better. The three of us didn’t stretch once over the whole trip – we were arrogant in our youth. Being flooded by the tide was a rather humbling experience for us all. Not to mention our clothes and tent were wet and muddy for the next two days. The second thing I learned came ten months after our tour. See, there was something romantic about the trip. Each day was better than the last (that’s especially true of the day following the night of day nine) and each day Monte, Jeff and I became closer. By the end of the trip we knew the preferred cadence of the other and would ride miles drafting inches apart, not saying a word, yet knowing exactly when a break was needed. The sense of camaraderie and shared experience was what brought us together and made those final days so blissful and, well, easy. You may say that we hit our stride. And I think that’s exactly it; we fell into a rhythm. As the trip went on, we fell into a rhythm, and that rhythm was desirable not just because it made things easier, but because now – months after the tour – I see that that is how we are supposed to live. In Acts 4, Luke states, “Now the full number of those who believed were of one heart and soul, and no one said that any of the things that belonged to him was his own, but they had everything in common” (v. 32 ESV). The members of the early church were on to something when they committed to each other and fell into the rhythm of life together. Each person, according to Acts, was working for the health of the community, selling land and houses to meet the needs of others. What I learned while on my tour was the beautiful rhythm of life with others. And further, how hard it is to attain. The rhythm that Monte, Jeff, and I reached on day 25 took climbing thousands of feet, several close calls from motorhomes and semi trucks, and an unprecedented soreness. Every mile of the tour was worth it, though. And like the tour, striving to create a sense of rhythm in my community in Spokane is worth it too. Being of one heart and soul may take more than going on a bike ride, but it is worthy of our attention and effort because through it we are given an opportunity to live among others, for others, and in Christ. Corey Zalewski has a B.A. in marketing and an MBA from Whitworth University. Second to riding a bike, his favorite thing to do is working on them. He currently lives in Spokane and works at KellyBrady Advertising. The inordinate valuing of individualism in America has devastated community. More than a duty toward others, community strengthens all parties. Community doesn’t cause one to lose their self identity to others, it creates a deep rhythmic intimacy with others. Well described, Corey, especially the parts about working hard, danger, and getting smarter together. Did I mention satisfaction like no other? Thanks for your thoughts, I really appreciate them. I agree, I think the desire to be different coupled with some old fashioned pride can be a recipe for isolation.